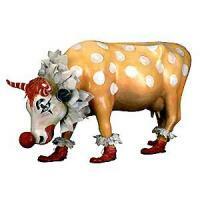 Can't Have a Parade without a Clown | CowParade New Figurines | One Price Low Flat Shipping! From the CowParade Retired Medium Collection, Can't Have a Parade Without a Clown. Featured at the CowParade Stamford 2000 exhibit. Made of resin. Measures 4" x 6". Brand new in box. This classic styled clown is wearing a yellow clown's suit with big white polka dots, fluffed color, and hobo-like reddish shoes. It is adorned with a silly oversized red ball nose!